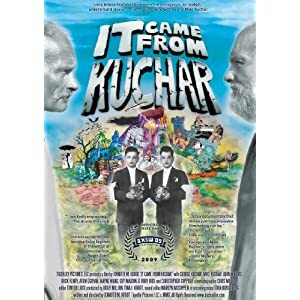 It Came From Kuchar is a feature-length documentary that mixes a number of filmmakers, critics, and close friends, singing the praises of the Kuchars with interviews with the brothers and footage of their films (past and present). And while it’s one of the most disconnected documentaries I’ve seen in a while, it’s also one of the most entertaining. The Kuchar brothers themselves are captivating to watch – whether they’re discussing their early filmography, sexual repression, their thoughts on filmmaking or their thoughts on art in general, you can almost always count on getting a good laugh from the semi-crazy (yet inspired) POVs the brothers take on any topic. The clips of their films are especially interesting (more of this footage would have been interesting to include). There is 48 minutes of bonus footage included on the disc for those who can’t get enough – and most of the footage here is worth watching (based on the assumption that you deem the documentary worth watching). That many of the interviewees are laughing as they speak of the “genius” of one Kuchar brother or the other leaves a bit of an open question as to whether even the most devout followers of the Kuchars view them as true geniuses or entertaining individuals with a penchant for filmmaking. But regardless of your final viewpoint on this matter, It Came From Kuchar is a thoroughly hilarious and intriguing documentary and while it may not inspire you to make your own no-budget movies, it might just inspire you to rent some. 1 user commented in " Movie Review: It Came From Kuchar "